Ergonomic handle with easy-grip surface prevents blister formation on the hands. No surface damage caused by rounded corners on the burr layer. Bypass for suction power adjustment. Integral adapter allows use of Festool extractor hoses. 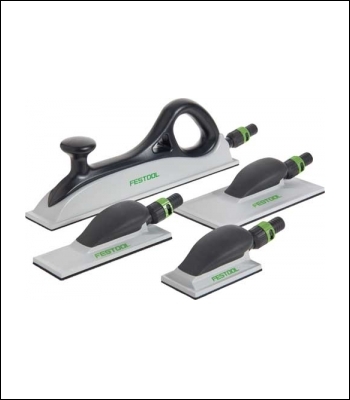 Ergonomic sanding pad compatible with Festool abrasive sizes. On the safe side - 4 sizes in one set. For coarse, intermediate and fine sanding. For rapid manual sanding of flat and curved surfaces. Suitable for long sanding operations when combined with dust extractor.